← Description of the Work. 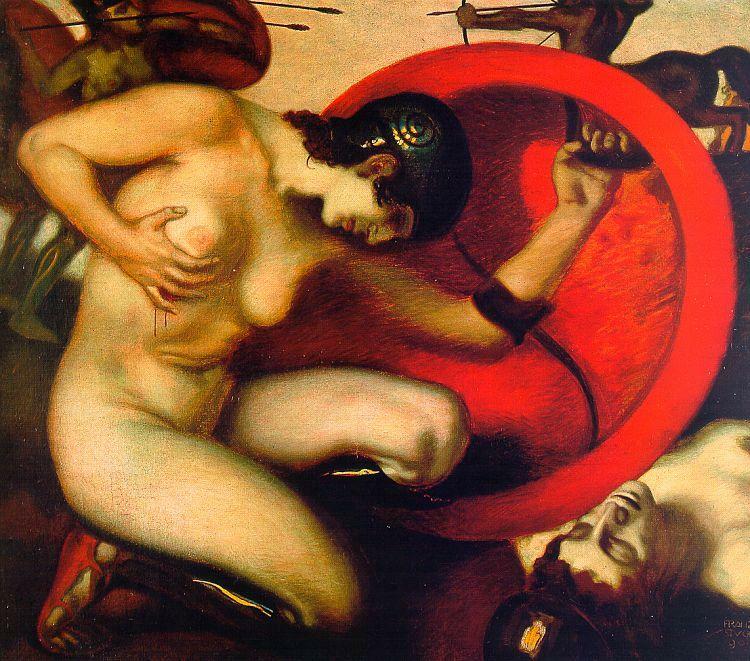 Above: Wounded Amazon by Franz von Stuck. These days I’m thinking a lot about my body and my relationship to it for two reasons. One, after the book deal, I’m aware of being a more visible public figure. Two, after a traumatic hiking experience in Belize, I started working out pretty intensively, just because I wanted to be stronger and healthier. Pilates, weights, cardio, yoga, strength, cross-training, cycling…you name it, I’m doing it. 1) I wake up in the morning without clothes and stand in the sunlight in front of my mirror. I think I look amazing. Muscled but soft, like a cross between an Amazon warrior and a Rubens goddess. Then I step on the scale and it reads 184. I’ve heard that that’s “bad.” I have an impression from media noise and social cues that it’s “bad.” So then I feel bad. This is an absurd situation. 2) I do Warrior One pose in yoga class in front of a full-length mirror. My upper arms are thick, almost like calves rising up out of my sleeves, and my tummy rounds out from between my T-shirt and drawstring pants, and I feel strong. But again, I have the impression from media noise and social cues that these are “bad.” That these are “problem areas” I need to “work on.” So I feel bad. Then I clear my head and focus on my alignment instead and happen to see another woman in the class, in the mirror behind me, and find myself admiring her gorgeous body. Then I realize she has a body just like mine. 3) A friend posts a blog that contains pictures of herself working out. She’s my workout hero and has a body I consider gorgeous and attractive. But in the post, she criticizes various aspects of her body. Her X is not okay, she says. I think: her X looks like my X. Does that mean my X is not okay, either? Does she imagine how others might feel, reading that? So I feel bad. And then I think: I wonder whether she would insist that my X is not like her X. That my X is fine, or better somehow. That I don’t have to “worry” about it. And then I would insist that her body image is distorted. And then she would insist that my body image is distorted. This is also an absurd situation. The absurdity stems from the dissonance between my instinctive love for the human body and the message that there are only some bodies I should love, and that my own is not one of them. Recognizing this inherent absurdity is useful, going forward. After all, I know whose side I’m on. Thanks for this honesty. Since becoming a personal trainer, I’ve actually gained about 40 pounds above my lowest adult weight (which was an unhealthy and ludicrous weight my dad described as “marathoner skinny”). I am stronger than I have ever been, I love lifting big, heavy barbells, BUT…those absurdities such as those you describe above will probably never my head. In my church, we have a period of quiet confession. Nearly every Sunday for the past five years or so (roughly the time period between me at my lowest adult weight and now), I have asked God to take away the idol of my weight, and to forgive the idol I’ve made it. I’m pretty sure my prayers are slowly being answered. Yeah, “idol” is a great way to put it. I realized that what I’d ideated as a healthy normal weight was actually the weight to which I dropped only after periods of intense stress or depression. I’m working on reorienting myself now. It’s hard, but so worthwhile. I loved this post and I have all the same thoughts and I’ve honestly never met a woman who didn’t. Thank you, Monique! “Absurdism” really nails it, gives it an aesthetic and philosophical name, puts it on the wall like a Dada painting. For more antidote, this essay in NYT today was terrific. Let’s all have our sweet friends’ and sisters’ views of ourselves!! Let’s believe each other.